Paper cranes in a church in PA. So cool. 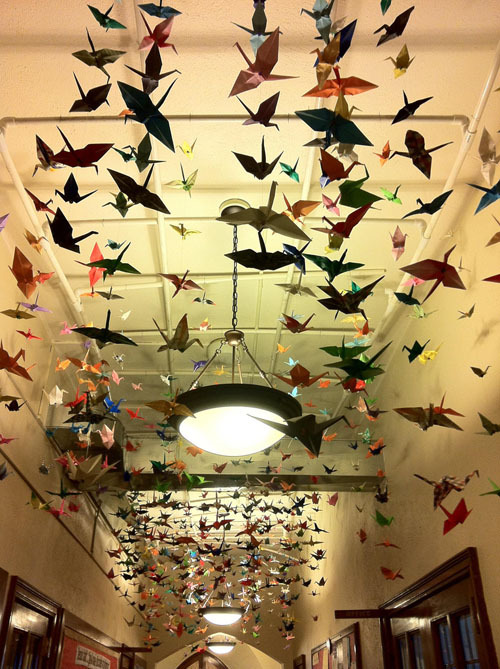 Reminds me of the book I had as a kid, Sadako and the Thousand Paper Cranes. So pretty! I played with the Warren Civic Orchestra in this church. Beautiful place. I think I took this same picture while standing in the hallway waiting to go out. Shan - I read that book too! I took an origami class at our library after that as a kid but never mastered the paper crane. Julia - love that you recognized it! Wow--that's a lot of paper folding!